EEWA produces semi-automatic foot switch operated sealers & trim sealers are designed for packaging applications, small quantity and occasional sealing applications. The dwell timer control system controls an indicator light which signals the operator separately for sealing and cooling cycle. Every pneumatic machine are provided with air cylinder, air filter, oil lubricator, and air gauge with suitable capacity and proper range. 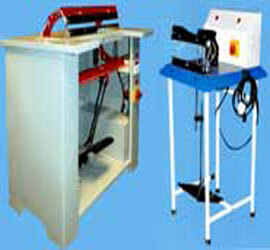 These machines seal polyethylene and other thermo-plastic films. # Seals polyethylene bags and any thermoplastic materials quickly and efficiently. # Equipped with a plug-in electronic timer and easy to use adjustment knob. Adjusting the sealing time provides for different material thickness. # Light indicates when seal is done. Once the correct time is set, the sealer will provide a perfect, consistent, flat seal every time. # Easy to operate. Simply set the timer, insert bag between the sealing bars, press down on the foot witch, and release.